e-Van Transportation has partnered with an authorised waste collection specialist in Dublin to offer fully licenced electrical recycling in Dublin and parts of Wicklow, Kildare and Meath. 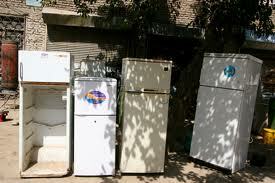 Need to dump old cookers, fridges, freezers, fridge-freezers, american fridges, dishwashers, washing machines, dryers, electrical heaters, microwaves, computers, hi-fi systems, televisions and also smaller electrical items, we can arrange collection and recycling of electrical appliances and electronics. Our collector has a waste collection permit. Fully licenced by the NWCPO, our disposals partner holds a Waste Collection Permit (NWCPO-17-11904-01), which will be produced on request on the day of collection. Our service partner is fully insured and licenced to offer electrical appliance recycling in Dublin, as well as disposal of many other types of waste. Under waste disposal legislation, it is illegal for a person to hand over waste* (including electrical appliances and electronics) to anyone other than an authorised waste collector who is in possession of a valid waste collection permit. Failure to comply with this law can lead to heavy fines for both the owner of the waste and for a person collecting waste without a permit. Our waste collector does have a valid waste collection permit, which can be produced at the time of collection. *Any item you no longer want and wish to have collected, including electrical recycling, is considered waste, regardless of its condition. The price we quote you for collection of household electrical appliances includes a fee per item, plus a collection fee from €40 to €70 depending on your location. There is an optional 2nd man available for an additional charge: this charge is €25 for most of the areas. All electrical appliances are taken to an authorised recycling facility. *€40 collection fee for one item applies to anywhere in South Dublin, and in North Dublin as far north as Swords, Malahide, Kinsealy and Portmarock area. Additonal charges apply to further North Dublin and The Greater Dublin Area. To find out more about how and why the price for Legal Waste Collection are at the rates that they are, and why to beware of anyone collecting for rates that seem too good the be true, click here. One electrical appliance will be collected at no additional charge, i.e. you only pay the collection fee. Additional appliances will be charged per item. Below are some examples of appliances and the fees per item. Other similar sized items not listed below would be charged the rate appropriate to their size. If you need to dispose of old electrical appliances and require a larger vehicle because you cannot fit these large appliances into your car, or because you don’t own a vehicle, e-Van Transportation offers the ideal solution for electrical appliance collection and recycling through our disposals specialist. A large box-back truck with a precisely calibrated weighing mechanism is used, so you can rest assured that you will pay for exactly what you dispose of in relation to it’s weight. 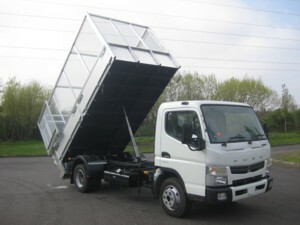 This large truck which will comfortably transport appliances, large and small, to an authorised recycling centre.